Mini Recessed & Pucks, Linear Task Lights, Flexible Light Strip, Rope Lighting and Mini Recessed ideal for under-cabinet, in-cabinet or display lighting. 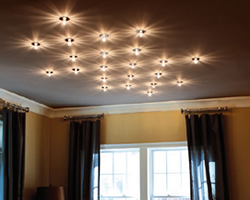 This collection of potracks and lighted potracks has the perfect choice for your interior. Keep your pots and pans where you can find them. Some of these even offer a combination of lighting and storage! Available in any a variety of metal or painted finishes with glass or shade options, these pendants beautifully add light and storage to your kitchen. 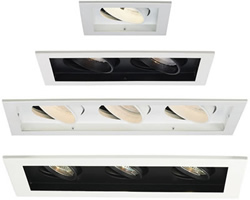 This collection of energy efficient Fluorescent ceiling lights offers choices for every style. Fluorescent is cooler and cuts down on shadows, a good choice especially for kitchens for bright ambient light. And don't forget it is energy efficient for lower electric costs. 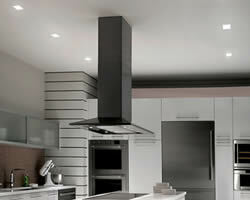 Recessed and multiple recessed lighting is another practical ceiling lighting solution. Choose from unobtrusive lighting and stylish recessed and can lighting options in a variety of sizes, shapes and light sources. Available in low and line voltage versions as well as a range of energy efficient options. Low voltage or line voltage track heads and pendants to fit Halo, Lightolier, Juno Single Circuit and Juno Two Circuit or compatible track systems and may be compatible to fit on existing track installations. Monorail is a sleek, versatile contemporary low-voltage rail system that can be customized for a variety of angular configurations or bent into soft curves for more fluid designs. Available as Components or Pre-configured Kits; single or 2-Circuit, Low Voltage or 120 Volt. See more choices on a desktop computer or by turning your screen horizontal. Copyright © 2018, 2019 design42 New Media Web Design. All rights reserved.